The APPLI group was created in 2013. The original idea was to put together two distinct scientific themes that are present at LOA: (i) the field of high-intensity laser plasma interaction and the associated know-how in the production and emission of secondary sources with femtosecond durations, (ii) the field of ultrafast dynamics in condensed matter and the associated know-how in time-resolved spectroscopies via pump-probe experiments. This is particularly relevant for triggering new synergies in the laboratory and to fully exploit the laser systems, the scientific expertise and experience that exist at LOA. The group has an activity on laser-plasma interaction, both theoretical and experimental. Here, compared to other groups at LOA, the specificity is that we use ultrafast lasers at high-repetition rate with low energy (<10 mJ). Therefore, we are trying to scale high-intensity laser-plasma interaction using low energy, compact and kHz laser systems, better suited to applications. The goal is to develop a laser-plasma accelerator producing an electron source with unique properties: femtosecond duration, relativistic energy and high-repetition rate. The high-repetition rate it important because it enables applications in ultrafast dynamics. Indeed, data accumulation and statistics are a pre-requisite in pump-probe experiments. In this context, the group also explores the application of laser-plasma based electron sources to ultrafast electron diffraction. In parallel, the group studies the ultrafast dynamics of various materials using more conventional and well-established techniques. 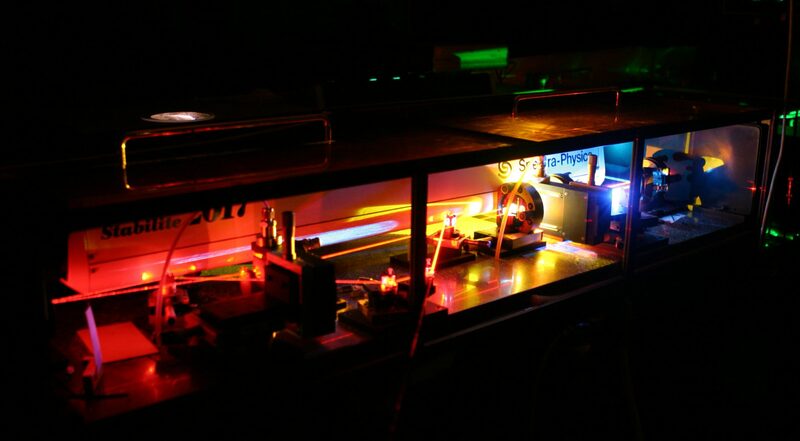 We perform pump-probe experiments using ultrafast lasers with adjustable wavelengths. 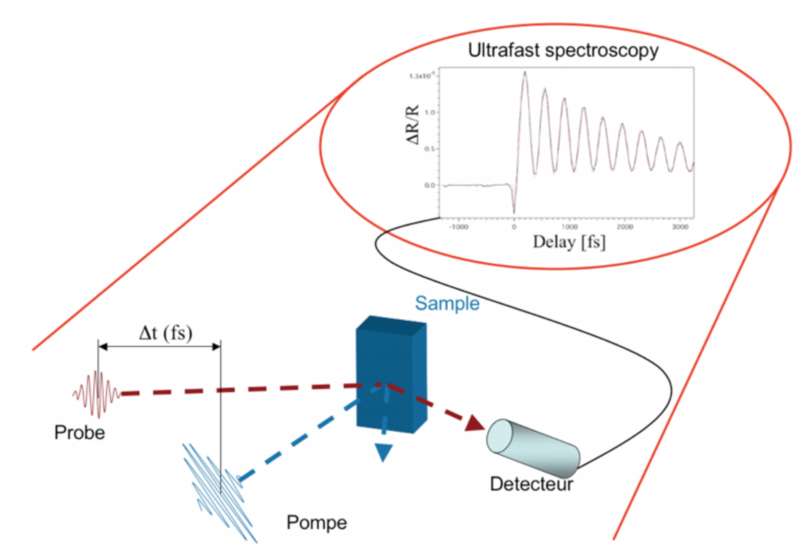 These experiments monitor the ultrafast response of the optical properties of the sample under study, such as the reflectivity or the absorption. We have also developed an ultrafast electron diffractometer in order to obtain direct structural information. These techniques give valuable information on the sample, either at the electronic level or at the structural level. We are interested in a variety of problems including the dynamics of phase transitions in materials with strong electron correlation, or electron-phonon coupling in confined systems. During the period 2013-2018, the group has published 28 peer reviewed articles & 1 book chapter. They presented 28 invited talks, 19 oral presentations. There have been 3 scientific awards and 2 Ph.D. defenses. « Photon number statistics uncover the fluctuations in non-equilibrium lattice dynamics » Esposito, K. Titimbo, K. Zimmermann, F. Giusti, F. Randi, D. Boschetto, F. Parmigiani, R. Floreanini, F. Benatti and D. Fausti, Nature Communications 6, 10249 (2015). «Real-time observation of interlayer vibrations in bilayer and few-layer graphene» D. Boschetto, Leandro Malard, Chun Hung Lui, Kin Fai Mak, Zhiqiang Li, Hugen Yan and Tony F. Heinz, Nano Letters 13, 4620 (2013). «Direct observation of electron thermalization and electron-phonon coupling in photoexcited bismuth» Faure, J. Mauchain, E. Papalazarou, M. Marsi, D. Boschetto, I. Timrov, N. Vast, Y. Ohtsubo, B. Arnaud and L. Perfetti, , Physical Review B 88, 075120 (2013). 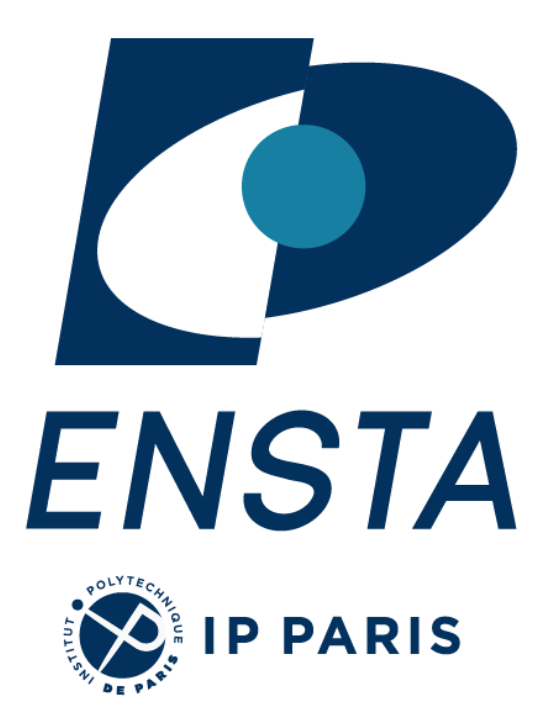 In close collaboration with the PCO group at LOA and the CEA group (F. Quéré), we have proposed to measure the electron beams produced when an ultra-intense laser pulse interacts with a solid density plasma with a controlled density gradient on its front surface. Our goal is to understand the physics of electron generation at the front surface in details and evaluate whether this is an interesting candidate for an electron source. We have mostly concentrated on proposing interpretations to the experimental results using theory and simulations. We have been able to identify a push-pull mechanism responsible for ejecting the electron out of the plasma. We also discovered that electrons can be further accelerated in the laser field in a process known as Vacuum Laser Acceleration. Experiments using the kHz Salle Noire laser at LOA have shown acceleration of large amounts of charge (10-50 pC per shot) but at non relativistic energies and the accelerated beams have very large divergence angles. At the moment, using such beams for applications is not very realistic. Therefore, more recently, we have been proposing new ideas to improve the quality of the electron beams that can be generated in this manner: for example, the use of a radially polarized laser pulse can increase the efficiency of the acceleration process while producing electron beams with narrower divergences. Laser-plasma accelerators have the capability of producing few femtosecond electron bunches, with, in principle, perfect synchronization with the laser pulse. Therefore, such electron bunches can become very valuable tools for femtosecond probing via electron diffraction if they operate at high-repetition rate with sufficient stability and beam quality. In principle, we have shown that they have the potential to provide sub-10 fs bunches on a sample, with the beam quality required for performing electron diffraction. In the framework of the FEMTOELEC ERC project, we have demonstrated the first laser-plasma accelerator operating at kHz, at the 100 keV level (2013-2015). In 2016, the Salle Noire laser reached new performances: the laser duration was decreased to the few cycle level, down to 3.5-fs, while keeping the energy at 3 mJ. This was a game changer for our laser-plasma accelerator as sub-5-fs pulses are needed to resonantly drive the plasma wakefields that accelerate the electrons. We were able to demonstrate a laser-plasma accelerator operating at kHz and delivering 5 MeV electron beams. 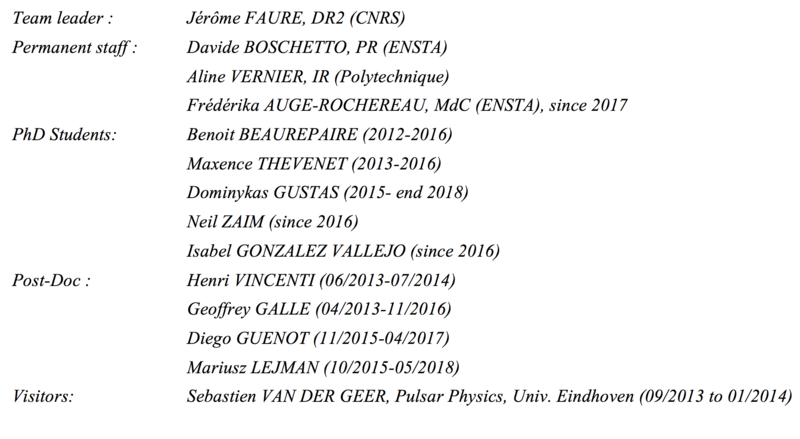 Since 2016, we have been studying and optimizing the electron acceleration process in the regime of few cycle laser pulses. kHz relativistic electron beams. Left: typical beam profile of the electron beam obtained in the interaction of a 3.5-fs laser pulse with an underdense microscale gas jet. Right: the energy distribution shows 5 MeV electron beams. The gray area represents the standard deviation of the electron distribution showing high stability. The injected charge range from 100 fC to 20 pC per shot, depending on the experimental parameters. Operation at kHz and increased stability of the electron beam allowed us to perform the first electron diffraction experiment using a plasma based electron source. In collaboration with the University of Michigan, we were able to demonstrate in a proof-of-principle experiment that this electron source is well suited for performing ultrafast electron diffraction. This was done using our earlier 100 keV electron source and the experiment was performed on a high-quality Si nano-membrane. The temporal resolution was limited to a few picoseconds in this first experiment, mostly because the electron source was non relativistic and had an energy spread of ~10%, causing the bunch to stretch temporally via velocity dispersion. The use of relativistic electrons, in conjunction with an appropriate transport beam line should allow us to reach sub-10 fs resolution. We decided early on that the group needed to gain expertise in “conventional” ultrafast electron diffraction in order to be able to be reactive when our plasma source is ready and to propose relevant experiments. Therefore we built a state-of-the-art ultrafast diffractometer based on a DC gun, delivering up to 60 keV electrons with bunch durations >300 fs and few fC of charge. We quickly realized that the biggest problem for these experiments comes from the sample: it has to be extremely thin (<100 nm) because the electrons probe the sample in transmission, and large transversely (100 micron scale) because the electron beam is weakly focused. 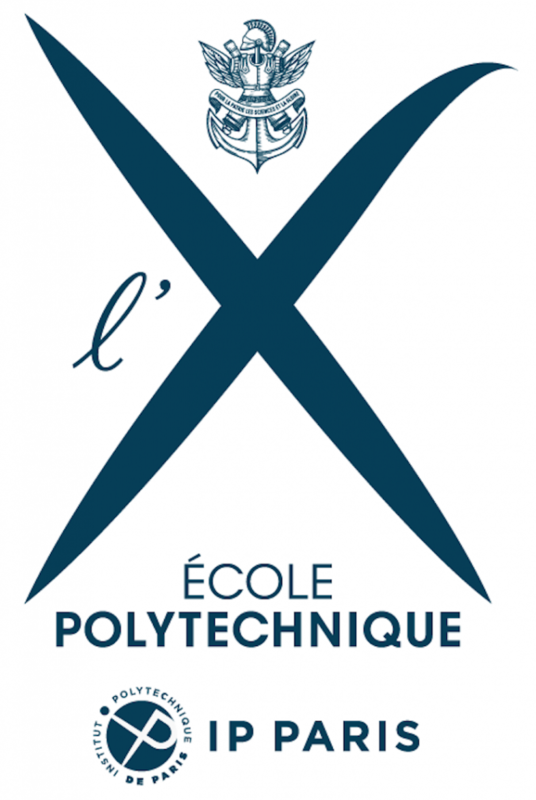 As it is extremely difficult to obtain such samples, we started multiple collaborations with LPS (Orsay), LSI (Polytechnique) and University of Wisconsin. It took us more than three years to debug the experiment, increase the signal to noise ratio and test different samples, until we finally obtained the first publishable results. We used a near perfect Silicon crystal and discovered that the dynamics of the Bragg peaks in a pump-probe experiment can be dominated by multi-scattering of the electrons in the sample. This effect is well known in microscopy, but it is the first time that it was clearly measured in an ultrafast electron diffraction experiment. This has important consequences for the interpretation of the diffraction peaks and their related dynamics in these kinds of experiments. Typical diffraction pattern from a Silicon nano-membrane, obtained using laser accelerated electrons at 100 keV. b) Dynamics of the intensity of the (220) Bragg peak, revealing lattice heating and electron-phonon coupling on a picosecond time scale. Time resolved pump-probe experiment on (LaS)1.196VS2for several fluences and parallel polarization configuration (left), together with the fast Fourier transform (right), where three coherent optical phonons can be detected. The major fact of the last five years has been the move from the old experimental setup to the new platform. We have widely used the capability of changing independently the wavelengths of the pump and probe pulses. We have investigated several materials, focusing our attention primarily on bi-dimensional systems and strongly correlated materials. After studying graphene, the prototype for 2D systems, we have started the investigation of layered incommensurate system, in particular the chalcogenure (LaS)1.196VS2, which exhibits an intriguing change of the resistivity of several orders of magnitude when submitted to an external electric field. We were able to discriminate a preferential coupling between the photo-excited electrons and three coherent phonon modes (see figure 3), and we did point out the dynamics of electrons trapping in the vanadium site, relied to the incommensurability of the system. As for the strongly correlated material, we have been working on the Mott isolator prototype V2O3, which exhibits a counterintuitive phonon hardening when excited in the mid infrared. We have investigated the sample not only by infrared optic, but also by femtosecond X-ray diffraction, using the X-FEL beam at SLAC in Stanford. It is worth saying that we have a strong collaboration with Stanford University on this subject.